With the 2013 model having heralded a complete redesign, the 2014 Honda Accord is the most refined edition of the automaker’s iconic midsize sedan yet. With a refined style, comfortable interior, and smooth driving dynamics, the new Accord has a lot to offer drivers in Middletown, Mechanicstown, and elsewhere. While we’re champions of the Accord here at Middletown Honda, we understand that some drivers may find themselves considering a competing model like the 2014 Ford Fusion. Let’s see how the two compare. MPG – With fuel costing as much as it does, efficiency is more important than ever. Fortunately, the 2014 Accord Sedan LX with a continuously variable transmission is able to achieve 27 mpg city/36 mpg highway/30 mpg combined. * The 2014 Fusion lags far behind, achieving just 22 mpg city/34 mpg highway/26 mpg combined. Power – It’s reasonable to think that greater efficiency means less power, but that’s not the case here. 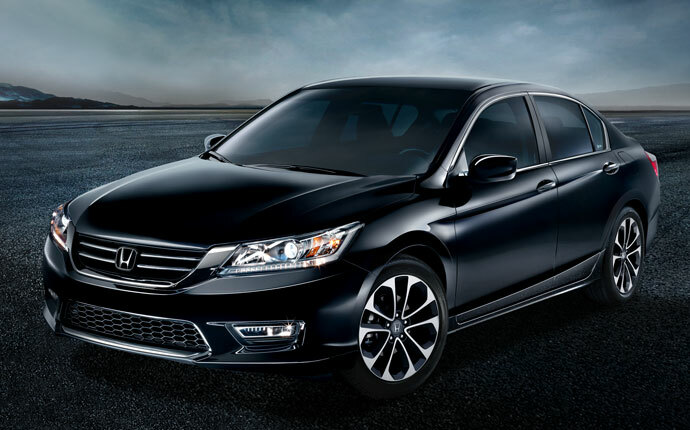 The Accord comes equipped with a base-level 2.4L four-cylinder engine that can produce 185 hp and 181 lb-ft of torque. The Fusion offers a 2.5L four-cylinder engine that manages only 175 hp and 175 lb-ft of torque. Safety – The 2014 Accord is also an exceptionally safe vehicle. The National Highway Traffic Safety Administration (NHTSA) gave it five-star ratings in the front side crash test, overall side crash safety, overall side barrier crash safety, and rollover safety tests. The 2014 Fusion earned four stars or less in all of those tests. Comfort – The Accord gives you more rear hip room and leg room than the 2014 Fusion, translating to greater overall passenger volume. At Middletown Honda, we’re thrilled to recommend the 2014 Honda Accord, and we’d love to tell you all about it when you come to our dealership. You can find us at 520 Rte 211 E in Middletown, NY, less than two miles north of Mechanicstown. While you’re here, you can check out the full lineup of new Honda models and take a test drive! We’ve also got an impressive selection of used vehicles and a service center than can take care of all your repair and maintenance needs.